Periodically I like to share some finds I've come across, and this is my personal pick list, in plenty of time for Mother's Day. I am confident you will enjoy the following, as will others if you give them as gifts. Read on, and note the special offers....In my book, everyday should be Mother's Day, so why wait to shop? For the bearly sleeping mum, slowpoke infant who is trailing a little behind or the energetic child looking for some puddle stomping fun, Hatley’s pajamas, loungewear and rain gear make cute and original gifts for holidays, occasions or just for fun…or maybe pun. I am a Hatley devotee. Since discovering their whimsical one size fits all sleepshirts while on vacation a number of years ago, I can't wear anything else. They make me smile, and engage my husband or anyone else who sees them, in conversation. Hatley sells apparel for kids and adults (including daywear, beachwear and footwear) and have a clever line of home goods, gifts and toys. If you are an animal lover (or butterflies, roses, etc), or just want to sleep in fun comfort, check out Hatley....and have a chuckle. Buy a sleepshirt for your best girlfriend, mother, etc. It makes a statement! Note: Save 20% on a sleep shirt for women or sleepset for a child with the code SLEEP20 if you order by 3/31. Click on the Hatley banner in this blog post to shop. I can't say enough about this line of glycerine hand therapy cremes. Sold in specialty and gift shops, I scoop them up whenever I stumble on them. But, I recently learned that you can now shop online, and I'm thrilled. I've been a fan for years after first sampling one in a gift shop in Vermont. Since then, I've been a loyal user and have tried a bunch of scents, and my personal pick is Oriental Spice, though they have many beauties to choose from such as Tuscan Honey, Gardenia Breeze and Secret Sea. I travel with them (they come in varying sizes and forms), give them as gifts, and lavish them liberally on hands nightly before going to bed. It's my evening ritual. I make sure to never run out. My preference is the creme in the plastic pots (though the lotions are nice too). They feel so smooth, rich, deliciously soothing, and smell amazing. I've tried other cremes, and in my book, Camille Beckman rocks! They also make foot, hair and lip care products, gift baskets and roll on perfumes. Click on the banner to shop. 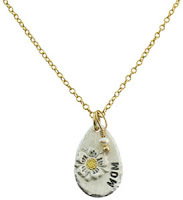 This special pendant, designed by Isabelle Grace Jewelry, is made of fine silver and 22 kit gold, and features the word "Mom" on one side and "You Make Me Bloom" on the other, along with a dangling freshwater pearl representing a seed that grows. Sold with a 16" or 18" chain, in either fine silver or gold-filled. A unique gift for yourself or a mother in your life. It's a real conversation piece, and something you can dress up or down. Email me if interested in purchasing. robin@motherhoodlater.com. 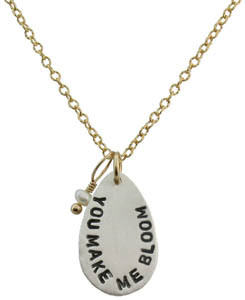 I get all kinds of comments when I wear this pendant, and you will too. Note: Be the first to purchase a pendant in the month of March, and receive a voucher for four (4) free tix to see the popular Off-Broadway family musical FRECKLEFACE STRAWBERRY. We ordered our holiday cards this year from Tiny Prints, and we got so many compliments on the card (even more than past years). Since then, I've been surfing around their site, and they have the cutest stationary pickings in general. Cards, announcements, labels, stationery, notebooks, gift tags, stickers, etc., Tiny Prints offers one stop shopping in the paper products arena. I love all the designs and styles you can choose from, and the card stock is good quality. There is something to be said for sending a pretty personalized note to a friend, so, if you're looking for a special gift, perhaps make up some note cards with a friend's name on them. You can also do it with photos. And, make cards up for your child. We use them for my son as thank you notes and birthday notes he can give to friends. I love this site, and am pleased to no longer feel the need to surf the web to find our holiday cards. I know I'll be shopping at Tiny Prints. Note: Save 10% On Tiny Prints Orders $49+ (Code AFF1105). Click on the banner above to shop. Since discovering their whimsical one size fits all sleepshirts while on vacation a number of years ago, I can't https://www.rx247.netwear anything else. They make me smile, and engage my husband or anyone else who sees them, in conversation.